Reservations for guide services can be made in advance. If you know when you will be visiting the park and desire to guarantee the services of your own personal guide for you or your family, be certain to make arrangements well in advance. The best way to do this is to call the ALBG Reservations line at 717-337-1709. This phone is answered when someone is working in the guide office. We have no full time office employees and at any given time, guides will be out in the field conducting tours. Please leave a message. It is checked daily each evening around 5 PM and someone from the Association will be back in touch to finalize your arrangements. generally the same evening you call but certainly within 24 hours. DO NOT CALL BACK BEFORE THAT TIME as it will result in duplicate reservations. 1. Length of tour, if longer than the normal two hour duration. 2. Special focus – concentrate on specific actions, units, events of the battle. $63 for 1 to 6 people. $83 for 7 to 15 people. $132 for 16 people and up. This fee covers the total number of people specified above on a comprehensive two-hour tour. Additional hours may be added as part of the reservation at a prorated hourly fee ($31.50 for 1-6; $41.50 for 7-15; $66.00 per hour for 16 and up). The two hour tour is standard but many opt for longer three hour, four hour, and occasionally all-day tours. Two hours is generally adequate for most first-time visitors. 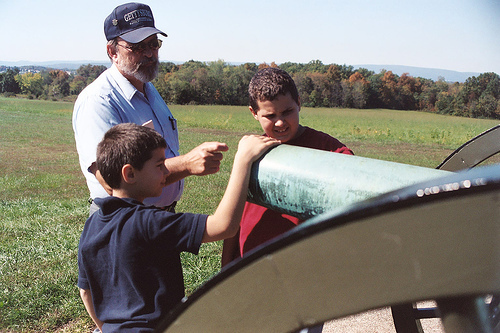 The National Park Service has allowed their management partner, the Gettysburg Foundation, to handle Licensed Guide Services for the Visitor Center complex. In return the Foundation is permitted to add a ticketing surcharge of $10-$15 per reservation on top of the guide fee. If you hire one of our guides at the visitor center for a car of five people the charge will be $75. That same car tour when arranged directly with ALBG at 717-337-1709 will cost $63. – the surcharge does not apply! 1. During the busy travel months MAY THROUGH AUGUST tour requests must be made a MINIMUM of FIVE days before the date of your requested tours. We will NOT be able to locate a tour guide with open time on their schedules anytime within that short period. 2. During the off-season, SEPTEMBER THROUGH APRIL tour requests can be accepted up to two days before your planned visit. Requests of less than 48 hours in advance of your requested time will not be accepted. Arrange to make your reservation as far in advance as possible. 3. Guide reservations are for personal tours in YOUR VEHICLE. There must be room in that vehicle to safely accomodate the guide as well as all members of your party. 4. Upon request, your guide will drive your vehicle to allow you maximum opportunity to look around and actually see the battlefield without worrying about traffic. There is no additional charge for this service. 5. Name request for a specific guide will be honored when possible. Should the named guide not be available another will be contacted. 6. Tour fees are established annually by the US Department of the Interior / National Park Service. This fee is payable directly to the individual guide at the time of the tour. Gratuities are at your discretion. 7. 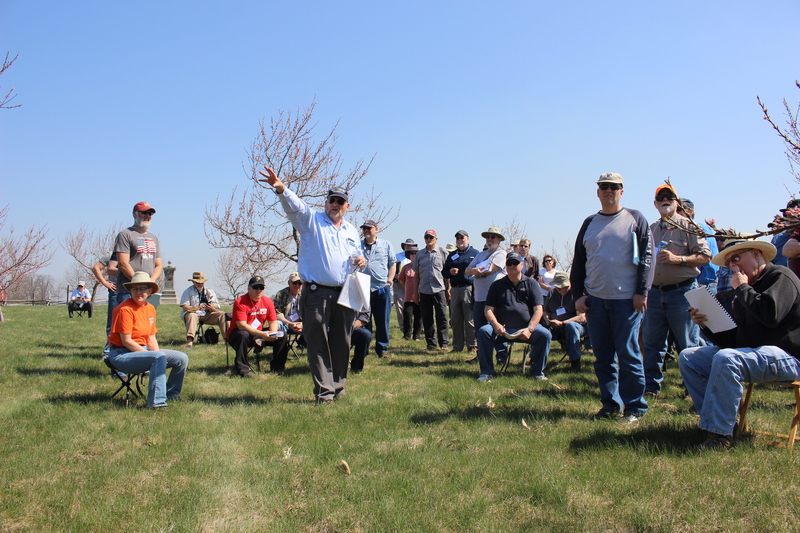 Only officially tested and licensed guide are legally permitted to conduct paid tours of the battlefield. All such individuals are required to wear the badge of the LBG (depicted above). Guides hired through our office OR through the National Park Visitor Center will be wearing this badge. 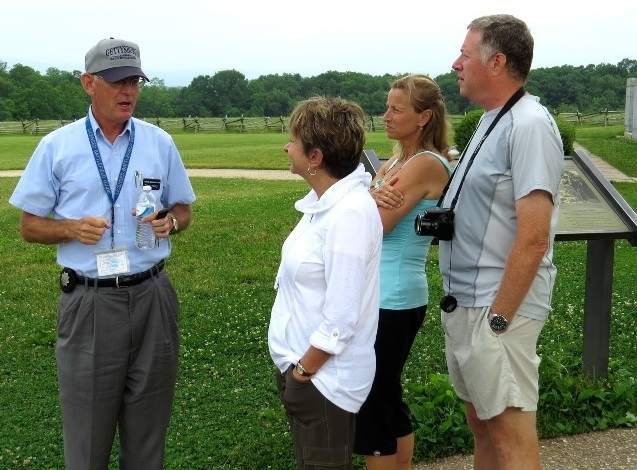 Other types of private tour companies utilize the NPS uniformed Licensed Battlefield Guide. Other individuals and companies using non-authorized guides are to be taken at your own risk. They have no relationship with the National Park Service, are not tested and licensed to ensure quality and are not bound by Park Service regulations. 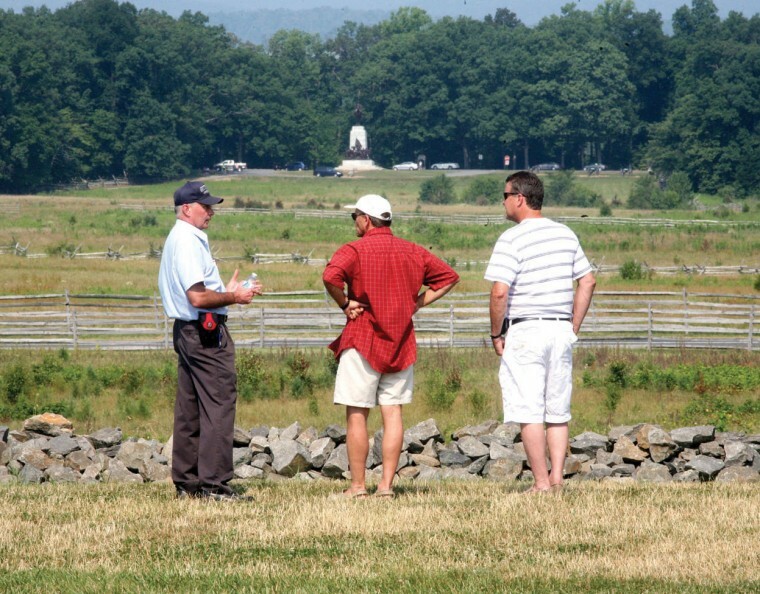 ONLY NPS Licensed Guides wearing the authorized badge are permitted to accept fees for conducting tours of the Gettysburg National Military Park. Please note that we can ONLY accept reservations for individuals and commercial tour companies desiring personal guides for battlefield tours. Those desiring guided horse tours, motorcycle tours, bicycle tours or guided segway tours must make those reservations through the websites of those companies. They do use only NPS-licensed guides but handle their own reservations. As a convenience you will find links to those below. ALBG bears no responsibility for actions of these companies or consequences that may arise in your dealing with these organizations. The links are provided as a convenient courtesy. Just as you can hire an LBG to give you and your family a tour in your own vehicle, these companies hire our LBG’s to conduct tours using their own unique forms of transportation. Gettysburg Tour Company In addition to tours on a double-decker bus (non-guided), the tour company hires LBG’s to narrate many of their tours on air-conditioned and comfortable coaches. National Riding Stables Horseback trailrides and narrated two-hour tours, conducted by LBG’s, are run from Artillery Ridge Campground on Taneytown Road. Visit this site if interested in that touring option. This company is owned by a long time Licensed Guide. Search the Internet for other stables in the Gettysburg area that also provide horseback tours and trail rides of the Gettysburg Battlefield. Motorcycle Tours Several of our LBG’s are experienced motorcyclists and have long offered tours to individuals or groups coming to Gettysburg by this form of transportation. They DO NOT provide motorcycles however. Should you desire to secure their services visit this link. Bicycle Tours GettysBike Tours offers regularly scheduled tours of the battlefield, again utilizing Licensed Battlefield Guides. Segway Tours One of the newest ways to experience Gettysburg is via the Segway personal transportation device and yes, the Licensed Battlefield Guides have individuals who give these tours under the sponsorship of SegTours, LLC. Gettysburg Foundation This is the non-profit organization that operates the National Park Service Visitor Center. In addition to selling tickets to the various attractions within the park they also schedule on-site guide services for both private car tours and bus tours.. Arrangements made via the Foundation will incur a $10 per tour surcharge which is placed on all such guide reservations. Bus and Van reservations have a higher surcharge.